Two recipes for fabulous Frozen Strawberry Margaritas, one is boozy, the other one is a virgin option. Whip one up today! This is a sponsored campaign, more details at the bottom at the bottom of the post! Sunday was National Margarita Day! Hope you were celebrating with a nice chilly margarita. That’s exactly what we did. Although I’ll readily admit mine was a virgin margarita. After being sick recently it’s all I could handle. You can surely add booze to yours though. I’ll give you both recipes, the full on boozy one, and the wimpy Kim version. Before we get into the silly today make sure you scroll to the bottom of the post for the giveaway. Bahama Breeze has graciously offered to give one reader a $100 gift card as a kick off to #VivaLaRita at Bahama Breeze. The Viva La ‘Rita event is being held between Feb 22 and May 5th at a Bahama Breeze near you. I’ll be visiting one myself soon so I can share my experience with you guys. It’s sure to be a riot. Any chance to be silly in public will not be wasted. I was so excited to delve into this project today. Making margaritas is always a blast. I’m one of those messy cooks, and this applies to making drinks as well. My kitchen looked like gremlins got in there by the time I was done. I honestly think stuff just tastes better when you make a mess. I have no proof this is true other than the fact that my recipe always come out great. When I try to be all “careful” and “clean” my recipes inevitably fail. So here’s your chance to tell your significant other that an expert is saying making a mess is important to the flow. That making a mess is the mark of a great cook, or drink maker. I’m sure this person will buy it. It’s funny because every time I head into the kitchen I tell myself to clean up as I go along. Then I get in the zone and all hell breaks loose. I just can’t help myself. I get so into what I’m doing everything else just fades away. When I finish I look around and have a brief moment of panic. Then I remember hubs does the dishes and I laugh, and laugh, and laugh some more. Okay, I don’t laugh, that would be mean. But I do giggle. It feels a little like payback for being a stay at home mom for over 20 years, all that cleaning stacks up. Now that we’re both working we struck an agreement regarding housework. Guess what chore I delegated to hubs? You betcha. So hubs got the short straw, he does my crazy stacks of dishes. I do all the cooking, and the laundry. The laundry I actually like doing. I find it cathartic somehow. There’s a cherry red laundry set that has nothing to do with my decision. Nor the fact that I crazy ocd about laundry. Or the fact that the one time hubs did laundry he ruined all my clothes. Nope, nothing to do with any of that. It totally works for us. It’s nice to get some help around the house. Even more fun knowing I’m the one making the mess for a change. We keep our sense of humour about all things in life, including housework. It’s the key to happiness. Plus it makes him super happy to go out for dinner from time to time. A night out means our kitchen isn’t being trashed. I don’t have to cook, he gets a night off of doing dishes. As we say in Canada…score! So we’re looking forward to a night out for Bahama Breeze Viva La Rita. It’s going to be so much fun to have some amazing food and a fabulous margarita. Then Bahama Breeze gets to do the dishes. Score. Now get your tush in the kitchen to whip up a great Strawberry Margarita for National Margarita Day. Then enter the giveaway at the bottom of the post to win a $100 Bahama Breeze Gift Card. To line the rims with sugar all you need to do is grab two shallow dishes or containers that fit the width of the glass rim. Pour a little water into one, then pour a little sugar in the other. About 1/4 cup of each is more than enough for 6 to 8 glasses. Turn each glass upside down then dunk in the water first, then in the sugar. Roll the rim around so the sugar coats the rim to you liking. Set glasses aside. You can also chill your glasses in the fridge or freezer if you like prior to pouring the margaritas. 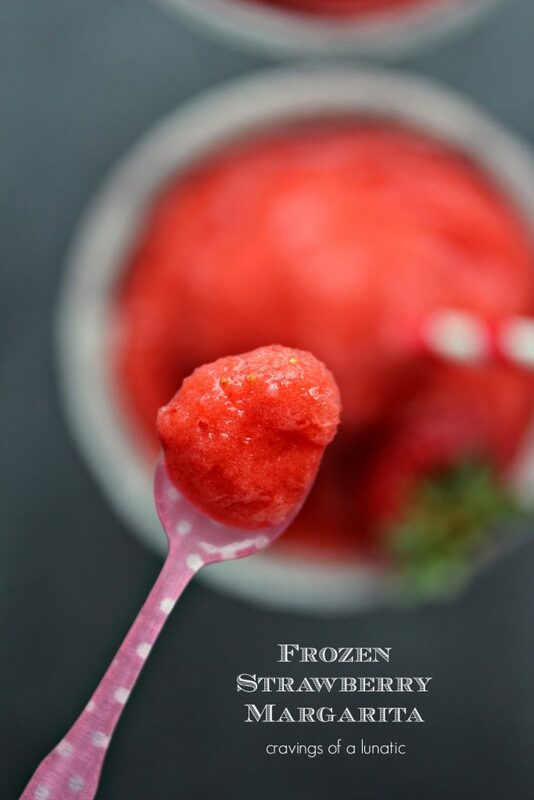 Now place the ice in the blender first and give it a few good pulses till the ice crushes, then add the frozen strawberries, frozen limeade concentrate, sugar, and about half the sprite. Pulse till smooth. You can add more sprite until you get the consistency you like. We like ours almost like a slushie. 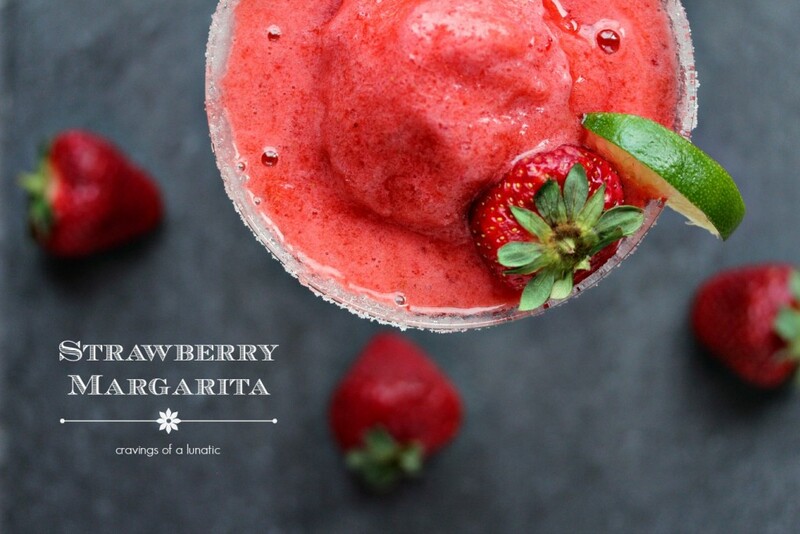 Pour into glasses, top each with a strawberry and lime wedge. Serve with a big old Virgin Margarita smile! Recipe created by Cravings of a Lunatic. Please note this is a large batch. We make a blender full since there are 4 of us. This can serve between 4 to 8 people depending on how you fill you glasses. Crush you ice in the blender first. Then add strawberries, tequila, limeade concentrate, and triple sec and give the blender a whir until the mixture is smooth and the consistency is how you like it. If you want it more slushie like add more ice, if you want it thinner you can add some sprite or 7up. Serve with a big old Boozy Margarita smile! I used this version for our spiked portions. It's absolutely lovely. This will serve 4 to 8 people depending how you fill your glasses. Hope you love whichever version you use. We love frozen drinks in this house, it’s like drinking a slushie, but on occasion a nice boozy slushie. Nothing wrong with that. I can’t wait to swing by Bahama Breeze for the Viva La ‘Rita event. I’ll be sure to zip a tasty margarita and enjoy all the fabulous food on their menu. Keep you eyes peeled for more details, in the meantime enter the giveaway to win a $100 Gift Card to Bahama Breeze so you can enjoy dinner and drinks on us. I love margaritas. This one looks SPECIAL like slurpee. Yum!!! 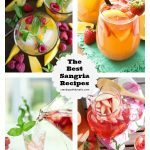 what a wonderful recipe love the looks of the margarita looks so refreshing a perfect drink! This looks like the perfect strawberry marg! The best line from ‘Pirates Of The Caribbean’ movie is…’Why is the rum always gone?’ I think that applies to tequila as well!! I love a pretty drink. This has to be the most beautiful margarita ever! I plan to check out the festival on my husband’s birthday. After the week I’ve had I would kill for a margarita! 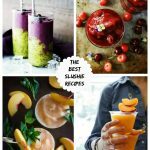 Anything with tequila would hit the spot, but these look excellent! 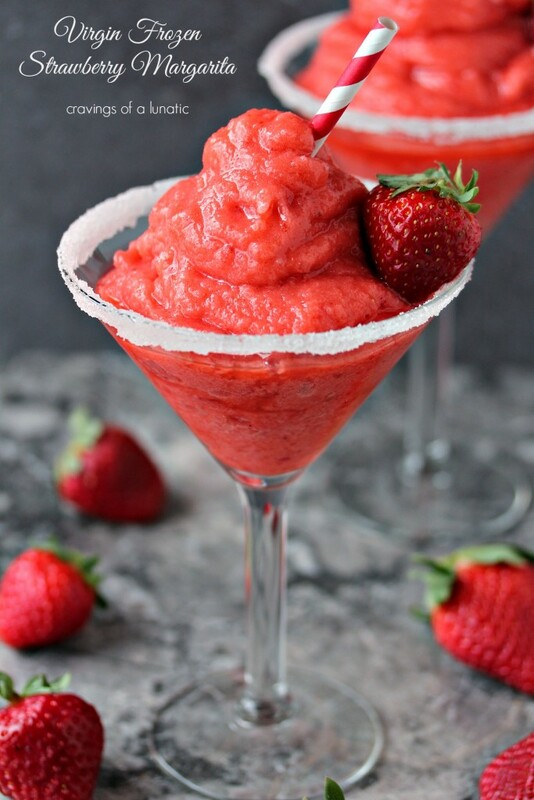 Love frozen strawberry margaritas!! I would love it if you link this up to Tipsy Tuesday at Grey is the New Black! What a gorgeous red color!! I love you made a non alcoholic version as well! Oh how fun!! Great giveaway!! I can’t wait for warmer weather so I can make these margaritas. I’m way too cold for them right now (haha). Love the vibrant red color! 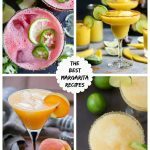 I love Mango Margaritas — actually, I love ALL kinds of Margaritas! Since it’s been snowing FOREVER we’ve been making a lot of margaritas. A jalapeno version is currently burning up our cocktail shaker. I like the Classic Margaria recipe that is easy to make and with salt on the rim. The texture on that margarita looks perfect!!!! i wish i could get my husband to help with the dishes. he always says he’ll do them, but then they sit there tormenting me for forever until I give up and do them myself. No restaurants close to me, but as soon as I’m in a city with one I’ll be checking out the #VivaLaRita Festival! Thanks so much Marla. I really appreciate it. 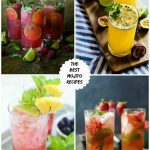 High praise too, I love all your cocktail recipes. I don’t drink but i love the virgin strawberry margaritas. hi, i had the most delish virgin strawberry margarita at family gathering & they were amazing, i should have asked for the recipe, but can’t wait to make your’s ,yum! thanks for a great giveaway ! Kim, these are GORGEOUS!!! Bring on the strawberry margaritas!!! I would check it out during Spring break. I would love to go and check out the #VivaLaRita Festival at the end of this next month for my monthly date night with my husband! I would check it out for my birthday! I plan on checking out the festival next month for my husband’s birthday! This reminds me of my vacations! On every cruise I go on, my favorite thing to get is the frozen virgin drinks – looks just like this! Love your photos – thanks for a great recipe! 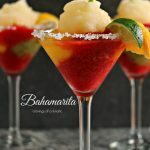 usually, I prefer a traditional on the rocks margarita, but this blended strawberry version looks like a must have for spring and summer parties! 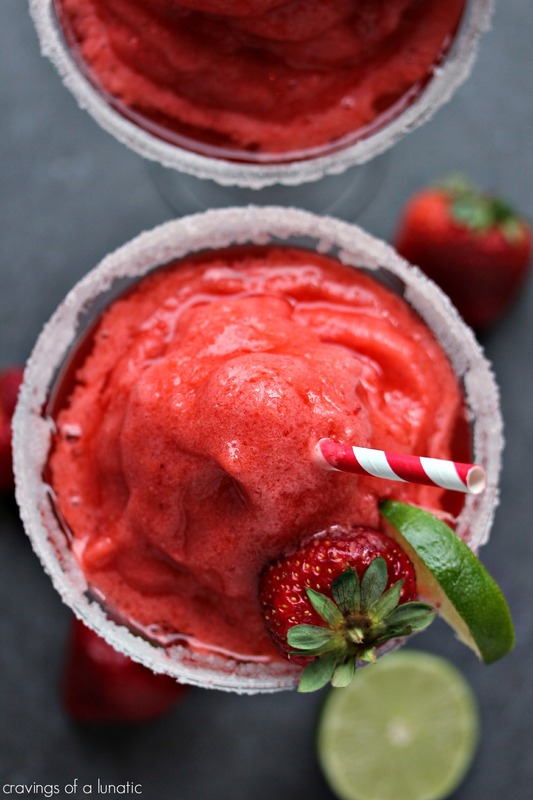 Strawberry Margaritas – my favorite drink hands down! Strawberry margaritas are on my favorites list. This looks so good! I don’t know if it’s just me but that margarita looks soooooo delicious.i love a good prickly pear margarita or a jalapeno margarita. Bring on the boozy! 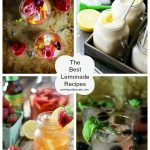 I love the idea of limeade concentrate… I can just taste these now! I love the fact that you made this two different ways! Looks amazing! Yesterday the rafflecopter said there was 2 months left. Now it’s closed? The contest was held through the company, so I’ll check with them. But it shouldn’t have said two months because the campaign doesn’t run that long. I know they picked the winner as they emailed me the name. It’s the first time I’ve done one that I wasn’t in control of the rafflecopter. I likely won’t do one this way again. I prefer to control the dates myself, and pull the winner myself too. This was a first for me, and not something I’m keen on doing again. I’ll be talking to the rep on Monday so I’ll let her know about your comment. So sorry if it was displaying incorrectly, that should never happen. But it actually ended days ago because the winner was pulled and alerted on the 10th. Might be a rafflecopter glitch.